$3.99 Rating: Not yet rated. Two estranged cousins, Ryan Marshall and Jarrod Conrad, must overcome their mutual animosity to defeat evil mastermind Alastair Holloway, who has stolen an antigravity machine and plans to use it to steal one billion dollars in gold bullion. Full of plot twists and turns you won’t see coming, The Fourth Law is a dramatic thriller that will have you guessing from the first page to the last! Two estranged cousins, Ryan Marshall and Jarrod Conrad, must overcome their longstanding mutual animosity and band together to defeat a common foe in the high-octane page-turner The Fourth Law by Paul Stein. An evil mastermind, Alastair Holloway, steals the revolutionary invention of Jarrod Conrad, an antigravity machine, but manages to pin the blame on Jarrod’s cousin, Ryan Marshall. When the two embittered cousins realize they’ve been duped, they reluctantly join forces to fight back against their wicked archenemy. But are they any match for diabolical Holloway and a gang of ex-military mercenaries, who plan to steal one billion dollars in gold bullion from Fort Knox with the help of the antigravity technology? Full of larger than life characters and written in the vein of the great thrill masters Tom Clancy and Robert Ludlum, The Fourth Law mixes science fiction and corporate espionage with wit and panache. 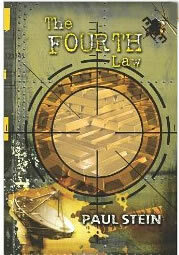 A thinking person’s sci-fi adventure, The Fourth Law explores the Gran… (Read more) Two estranged cousins, Ryan Marshall and Jarrod Conrad, must overcome their longstanding mutual animosity and band together to defeat a common foe in the high-octane page-turner The Fourth Law by Paul Stein. An evil mastermind, Alastair Holloway, steals the revolutionary invention of Jarrod Conrad, an antigravity machine, but manages to pin the blame on Jarrod’s cousin, Ryan Marshall. When the two embittered cousins realize they’ve been duped, they reluctantly join forces to fight back against their wicked archenemy. But are they any match for diabolical Holloway and a gang of ex-military mercenaries, who plan to steal one billion dollars in gold bullion from Fort Knox with the help of the antigravity technology? Full of larger than life characters and written in the vein of the great thrill masters Tom Clancy and Robert Ludlum, The Fourth Law mixes science fiction and corporate espionage with wit and panache. A thinking person’s sci-fi adventure, The Fourth Law explores the Grand Unified Theorem of astrophysics. But The Fourth Law is also a deeply felt character study about the bonds that tie family members together, and how the force of good might triumph over the darkest most sinister evil. Full of plot twists and turns you won’t see coming, The Fourth Law is a dramatic thriller that will have you guessing from the first page to the last!